Please choose how many product colors you want. • Liven up your next event with a white noisemaker customized with your logo. These durable, inflatable thunderstix are a perfect way to promote or support your favorite organization. Save money without losing quality! • Imprint your company or organization's logo and slogan for instant brand recognition. 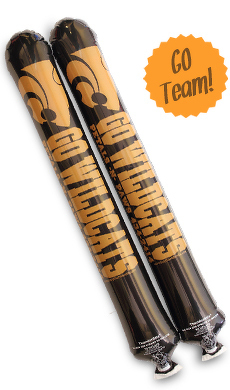 Thunderstix double as an entertainment and promotional product. • Designed for printed white thunderstix noisemaker. JJ was VERY helpful with getting my order together and making sure it was exactly what I wanted. Larry was able to take my color art and turn it into black and white for me. I got the Thunderstix today, and I am in love with them! Thank you all for your help, I will definitely order from you all again! thank you very much A "10" for service fast and delivered on time TROY and TYLER are excellent!! Received my custom thunderstix today. Just ordered them less than a week ago. They are awesome! Can't wait to have them at our event! The service and communication was great all throughout the process. The Thunderstix arrived very quickly and in a prompt manner--even before we expected them to arrive! Product is great and just as shown in the example! We use these for our events and they get used up quick. For the price point, these are a great find! I needed them for a 650 person we are having. The company was able to work with us on several different proofs to get what we wanted. I'll definitely order again next year! Some thunderstix did not steal. loved the thundersticks wow what a racket! I ordered thundersticks for my wedding. The online chat was very helpful and my thundersticks look great! They were delivered so fast! Easy ordering, Very helpful people, Fast shipping! Very helpful service and on-time delivery! Thanks!